Monnickendam is a old Dutch fisherman’s village, located just 13 kilometers North of Amsterdam. Just like the sister villages of Edam, Volendam and Marken, Monnickendam is perfect for a half day trip from Amsterdam. All of these villages lie in the most beautiful Dutch landscape: behind dikes, with meadows and farms all around. At Monnickendam you can taste the best herring and smoked eel, walk around the picturesque harbour, try a Dutch lunch of kroketten and apple pie and enjoy the beautiful views. The most famous produce of Monnickendam is smoked fish. In the 1960’s and 1970’s there were over 30 smokehouses. You can immediately smell the smoked mackeral and eel when you enter the little lakeside harbour. Delicious. In summer, Monnickendam celebrates this old Dutch tradition of smoking fisch during the Monnickendam Fish Days (Monnickendammer Visdagen). The little town is all dressed up for this special occasion. The villagers are dressed in traditional clothes and show old Dutch crafts such as basked making, wooden shoe making and fish net makers. You can taste local products and listen to special choirs singing old fisherman’s songs. Explore the countryside of Amsterdam and cruise along the beautiful typical Dutch landscapes on an E-chopper or E-bike. The tour starts in Volendam where you wander around the maze of small streets. Then you ride to a cheese farm in Katwoude where you can taste cheeses. At Monnickendam you weill see the beautiful houses, the old harbor and charming terraces. After Marken you will go on the boat back to Volendam. Explore the Dutch countryside in a comfortable car on a full-day guided tour from Amsterdam. You will visit the windmill village of Zaanse Schans, the picturesque fisherman’s villages of Monnickendam, Edam and Volendam and the island of Marken. Lots of time to relax and enjoy Dutch food like pancakes and herring. Journey through the picturesque countryside of Holland aboard a hop-on hop-off bus. See the historic windmills of Zaanse Schans, learn more about cheese production at the Jacobs Hoeve cheese farm and much more. The buses operate every 45 minutes from each stop. Via an audio guide on an app you get information on the bus and in the villages. 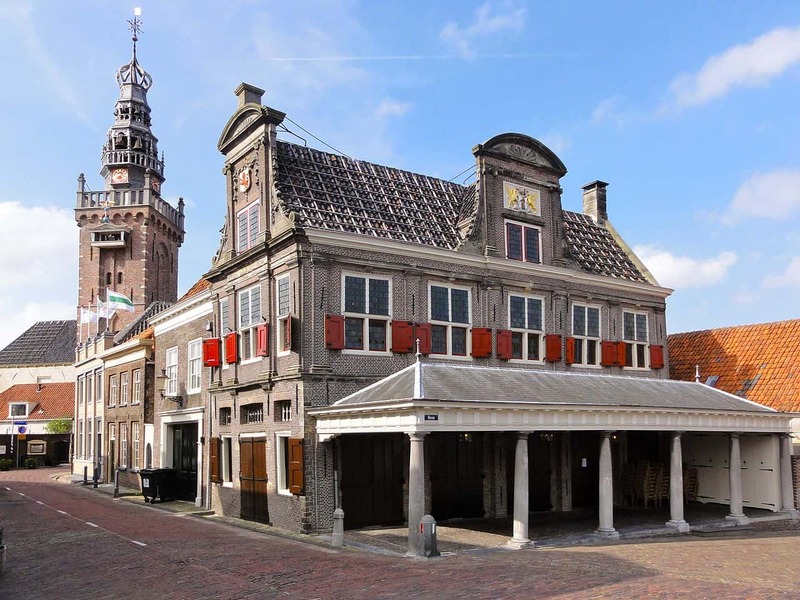 Monnickendam’s history goes back to the 14th century. After 1575 the town flourished. The village was set in a very good location along the river Purmer, connecting the Southern Sea (now IJsselmeer) with the lakes and towns in the backland (Purmer, Beemster, Schermer, Alkmaar, all famous for their Dutch cheeses). This was an important shipping route to and from the Baltic sea region (Northeast Germany). Most of the buildings, but also the names of the street, are reminders of this busy period. There are many cheese factories, ship wharfs and smokehouses to visit during a day trip to Monnickendam. But Monnickendam also has experienced darker days. In 1484 and again in 1513 terrible fires destroyed the town. In 1916 the dykes broke, and the seawater entered the city. Only the Big Church was kept dry, and all the farmers led their cattle into the church. In The 1960’s the town was expanded. The IJsselmeer is a popular lake to go sailing. There are several companies where you can charter a yacht. The yachts do not require a captains licence, but obviously, some sailing experience is necessary. If you lack the necessary sailing experience, you can step aboard a traditional Dutch barge for a half day trip to Monnickendam. The boat takes 4 hours. The flat-bottomed ship sails between Amsterdam, Volendam, Marken and Monnickendam. On board you can enjoy regional specialities such as dutch apple pie, freshly smoked eel and a local captain bitter. The area around Monnickendam, Volendam and Marken is, is called Waterland. This area is very popular for cycling. The (farm)land is flat, the distances are short, the views are wide and you will encounter many small villages and lakeside cafés along the way to have apple pie and beers. Holland is a cycling country and so the entire country is lined and dotted with special signposts for cyclists. The cycling signpost system in the Netherlands works through junctions (fietsknooppunten) that you will find along the way. Every junction has a number and and an information board which contains an overview map. Each time you reach a junction, you can decide to shorten or change the route. To cycle from one junction to another, just keep following the route signs with the number of the next junction. It couldn’t be any simpler. Learn more about the system and find a route you like at: http://www.hollandcyclingroutes.com/. Cycling to Monnickendam is a great way to see the Dutch country side and spend a day trip to Monnickendam outside of the busy city.